There is nothing we enjoy more at The Next Oil Rush than a good old “we told you so”. 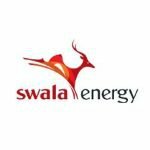 Swala Energy (ASX:SWE) has been up over 50% since we published our research report in June, and appears to be maintaining this upward momentum week by week, driven by their focused acquisition strategy and some exciting news released by oil explorers operating nearby. Our June Report titled: “ The last junior oil explorer operating in this exciting region with this same JV partner went up 800% in a matter of months ” outlined in detail why SWE provides such an exciting value proposition, detailing the striking similarities between SWE and the wildly successful Africa Oil Corp (TSX:AOI). AOI went up 800% employing the same strategy as SWE, in the same region. Looks like SWE still has 750% to go before it can eclipse our previous call on AOI and we are watching with great interest. 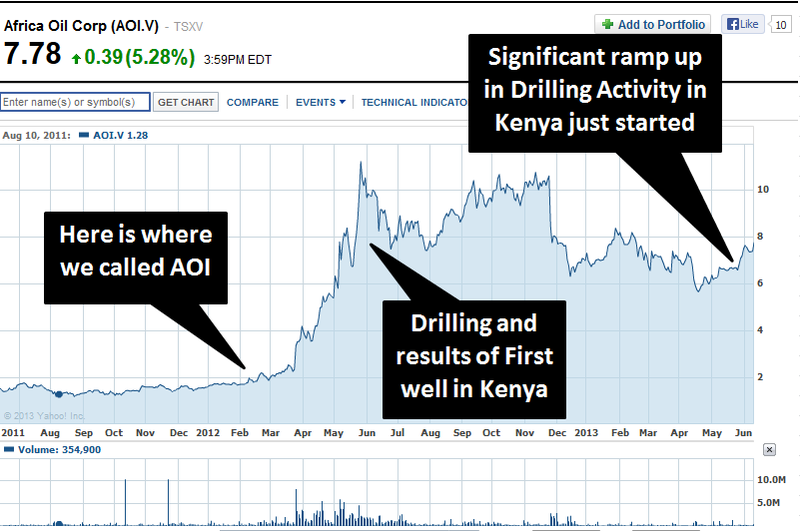 In March 2012, AOI was in the same position as SWE is right now – they had acquired a lot of prospective blocks in East Africa but had yet to drill a well. If we compare the value of the two companies when they were in similar positions, SWE’s market cap needs to increase FIVE TIMES OVER to be at the same level as AOI was back when they had not drilled yet, let alone increase 60 times over to match AOI’s market cap after their first oil strike. This is the holy grail of oil exploration companies – finding enough oil to start planning to build the infrastructure to extract and export it. Any infrastructure built in the region will be a huge benefit to SWE, and the fact that commercial oil has been confirmed close by greatly de-risks the SWE story. The Next Oil Rush called AOI in early 2012 and the stock price subsequently rose as high as 800% over the next few months. Given the striking similarities between AOI and SWE in the region and recent commercial oil discoveries, we are hoping that the recent 50% rise in SWE is the start of something much bigger. We are watching very closely for these 2D seismic results as they could potentially identify a similar multi-billion barrel basin as the one successfully drilled by AOI to the north (the Lokichar basin). 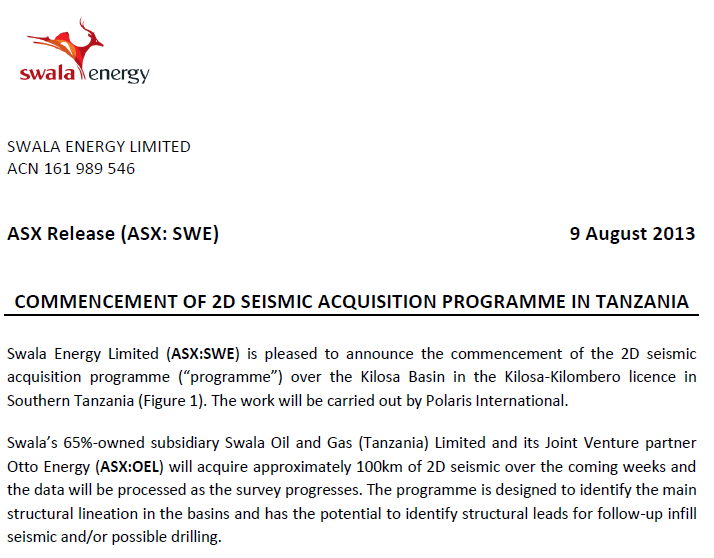 The other interesting thing to note is that since SWE has contracted the Seismic team to do the one basin and pay for them to mobilise in the country, they might as well get them to stay on and run seismic over FOUR SEPARATE BASINS. 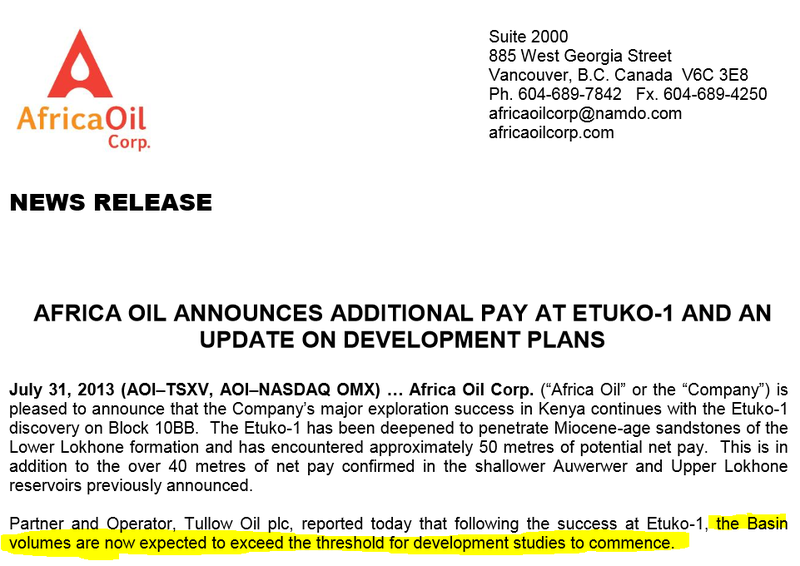 That is potentially FOUR multi-billion barrel prospects being identified and announced over the next few months. SWE is commencing a road show on September 2nd and the directors will be visiting brokers and institutional investors and presenting the SWE story – these road shows usually result in some positive share price movements and generate a lot of interest with fund managers and other high net worth investors with loads of cash to invest. How does The Next Oil Rush know about the SWE road show? Our stock broker told us of course. A brokers full time job is know this kind stuff and to keep their clients informed. This is the kind of precious information that you miss out on if you don’t use a broker – If you are interested (or already invested) in SWE send us an email and we’ll introduce you to our broker, who is an expert on SWE. 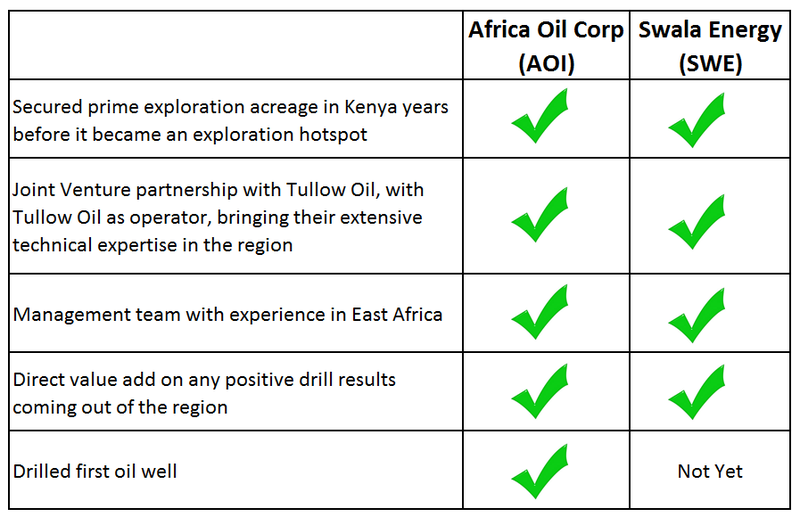 The Next Oil Rush believes that SWE’s strategy of building a portfolio of highly prospective oil blocks concentrated in East Africa will make them a logical acquisition target for a major oil company who wants exposure to the region, and have missed the boat after the East Africa land grab of 2012 saw all the exciting permits snapped up by companies like SWE and AOI. 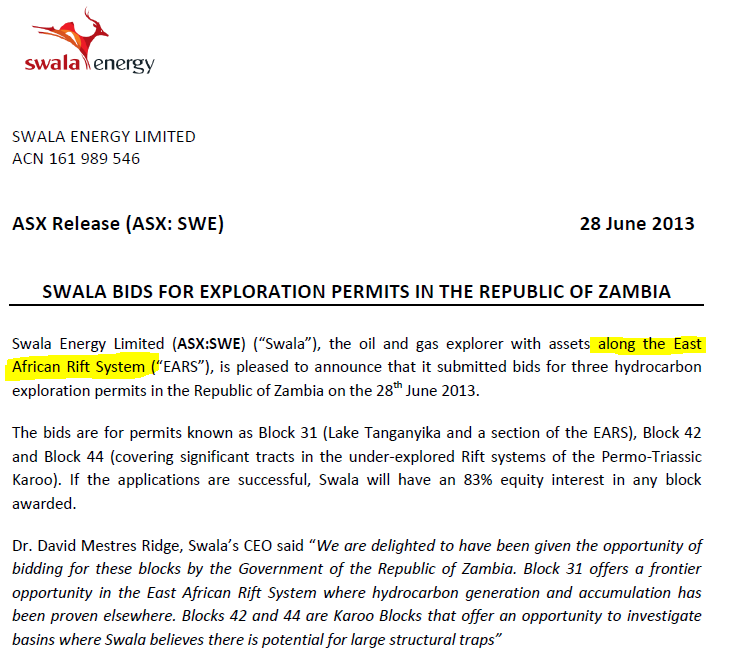 The Next Oil Rush is very excited to be following SWE just as the East African Oil story is heating up. SWE has been up over 50% since we released our June Report titled: “ The last junior oil explorer operating in this exciting region with this same JV partner went up 800% in a matter of months ” . Remember to always seek professional advice and this this is just our opinion on SWE. Do not take this as investment advice. All information presented in this article is publicly available.